Illinois unemployment rate hit 10.5% in September of 2009 and a Kewanee-based company, Jensen Construction, chose to use out-of-state workers to build a $3M building in Sycamore, IL. According to Illinois Department of Employment Security (IDES), the unemployment rate in DeKalb County is 9.2%. union members from a number of trades picketed the construction site using banners. When one picketer left the site to answer an emergency phone call, he returned to find that the banners had been stolen. 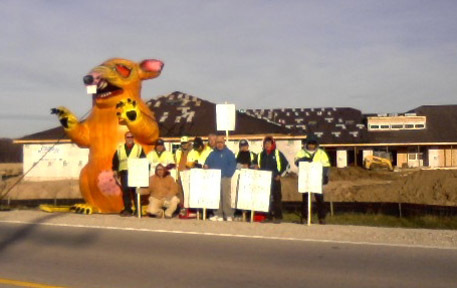 Unions responded by putting a rat out in front of the construction site. On Saturday, Sept. 26, 2009, Carpenters Local 195 joined other members of the Illinois Valley Building Trades to picket a new Hampton Inn that is being built in Peru, IL. The Hampton Inn is being constructed in an enterprise zone and will not be paying property taxes for 10 years. They are using materials and workers from Indiana instead of supporting the local Peru economy. Perhaps this photo says it best.